I haven’t blogged for a while so, while the weather is against me, I thought I’d sit down and write a short blog about how we approach each project so that you can understand the process we have to go through. When I became qualified to fly my UAV commercially and was approved by the Civil Aviation Authority (CAA) for aerial work I had to submit my Operations Manual. I passed a flight test carried out against my own manual and had the Ops Manual approved by both the CAA and EuroUSC who administrated the qualification. In order to keep my qualification and permission I have to adhere to the processes in my manual. I try to keep this as simple as possible for customers as I know that, at the end of the day, you really just want your photos or video! So, I will do as much as possible to minimise the paperwork and allow us to get on with the interesting bit. This is also the reason why I am not able currently to put prices on my website. Every project is different. Some require only an hour or so of planning in the office, particularly if they are repeat projects. Others require days of planning and communication with other agencies. Generally we cannot just run out and fly a project for you as we would probably end up breaching CAA legislation, but we will try to mobilise as soon as possible if that is required. When you first contact me it is very useful if you are able to give me an exact postcode for the site of the operation so that I can check the site online. I will also need permission of the site owner. There isn’t really any such thing a “public land”, generally there is somebody who has ownership or responsibility for the land. This may be a private land-owner or a parish, district or county council. If the land-owner is you that makes life easier! I also need to know other things. Is it a fixed date? Do you require video or still photographs? Do you need editing? If you are able to think about these things a bit before contacting me it is very helpful. I will find out all of the above by giving you a “Form 1” (imaginative, I know!). All being well, it is the only paperwork you will have to fill out. We will then need to carry out a site survey and risk assessment and fill in a “Form 2”. This is for our benefit as the CAA have the right to request paperwork for each operation we carry out. If the operation is relatively simple then it may be possible to carry this out on the day, otherwise we may need to make a site visit. This will all be budgeted for in my initial quote. There will be no surprises in terms of price unless you ask us to do extra work on top of what we have already quoted for. We will then provide you with draft images and the final images will be released on payment of your invoice. I am afraid we have to work this way now as one slightly unscrupulous customer exploited our good will. With most of our imagery, we retain the copyright on the images and grant our customers an unlimited licence to use the images for their own purposes as long as it doesn’t involve reselling all or part of the images. In that case we would need to have further discussions before carrying out the project. I hope this helps you to understand how we treat each project. As far as I am concerned, the safety of our customers, crew and the public are paramount so I will endeavour to provide you with great imagery at a fair price without compromising on safety. Engineers at a Norfolk firm are using their skills and knowledge to support product development at a local start-up business. Composites engineers from Mussett Engineering, in Loddon, are working with aerial photography firm HexCam, based in Taverham, Norwich, to look at ways to make their innovative radio-controlled multirotor aerial camera system lighter and stronger. 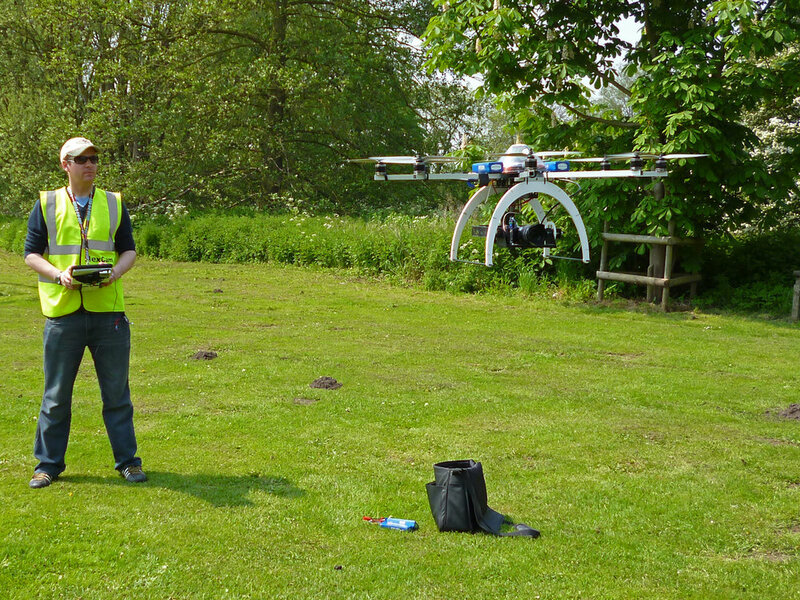 The radio-controlled aircraft are used to take aerial photos and HD video anywhere from ground level to 120m altitude. Composites manager Graham Muff said: ‘These sort of projects are really interesting for us as they pose new engineering challenges. Elliott Corke, director of HexCam, said: ‘We are looking forward to working with Mussett Composites.